Dictionaries are more than just books. Not only are they an indispensable tool for language students and scholars alike, they are also treasure chests. You may not be aware of it, but many dictionaries contain rare gems; odd, peculiar, out-of-date or nearly forgotten¹ words that were nonetheless in use at some point² – after all, they were collected and put in there in the first place. These words can be puzzling, amusing or downright disturbing, but they are all noteworthy. 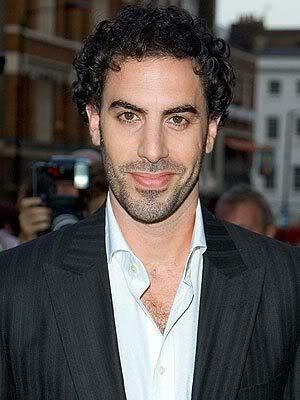 I googled "chameleon + jew" and I got Sacha Baron Cohen. Figures. Since he's handsome, he stays. The preferred dictionary for most learners of the Arabic language, that Bible of Orientalists; the Hans Wehr Dictionary of Modern Written Arabic³, is full of such words. It is still in near-daily use with me, and as such, I’ve come across many of its treasures over the years. I want to share them with you, so every Wednesday I will present one of my findings here, with explanations and comments. Enjoy! جمل اليهود (jamal al-yahūd): chameleon. Literally: camel of the Jews. This is listed under jamal (camel), and while it strikes me as, well, odd, I’m sure there is a perfectly reasonable etymological explanation. Somewhere. Wikipedia suggests that the Arabic word for chameleon is حرباء ḥirbāʾ, which is also listed in Wehr with the same meaning. An image search yields some interesting results. See for yourselves. I don’t know how “camel of the jews” came to mean chameleon, but I sure would love to hear the story of it. ¹ Except that the Arabic language doesn’t forget, because it is apparently an elephant. ² Except maybe half the entries in Arakin’s Norwegian-Russian dictionary. He must have made them up. ³ I’m using the fourth edition from Spoken Languages Services, Inc. I’m given to understand that the Librairie du Liban edition might differ slightly from this one. This entry was tagged arabic, hans wehr, language, wehr. Bookmark the permalink. Gleder meg til å lese den teksten! Men ikke bruk Arakin i oversetterkonkurransen.